The Coordinated Assessment Model (CAM) is a systematic approach to homelessness that focuses on aligning the needs of individuals and families experiencing homelessness or at imminent risk of becoming homeless to available shelter and housing resources. CAM’s vision is to orchestrate a community response that creates an accessible, efficient path to housing for households facing homelessness. As the Detroit Continuum of Care (CoC) lead agency, the Homeless Action Network of Detroit (HAND) is responsible for developing a coordinated entry process for the Detroit CoC. Southwest Solutions serves as the lead agency for implementation of the CAM (Detroit’s coordinated entry process), in partnership with Community and Home Supports (CHS) and Neighborhood Service Organization (NSO). The process directs households in need of homeless assistance to a common access point where they are assessed using a universal screening and subsequently, a common assessment tool. Based on the thorough assessment, consumers may be referred to a housing resource when vacancies occur. 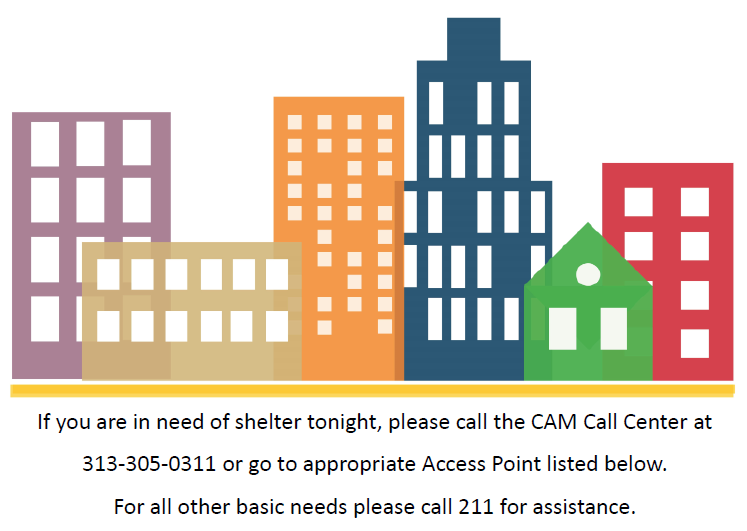 The CAM is a concerted effort to create a standard and uniform process of assessing, prioritizing, and referring households to emergency shelter and housing resources. Conversely, the CAM is not a program or housing provider, is not the answer to every housing crisis, and due to the prioritization of limited resources, cannot guarantee that any individual will receive a referral to a shelter and/or housing resource.